The next HSBC World Rugby Sevens series heads to Hong Kong from 6th to 8th April,2018. 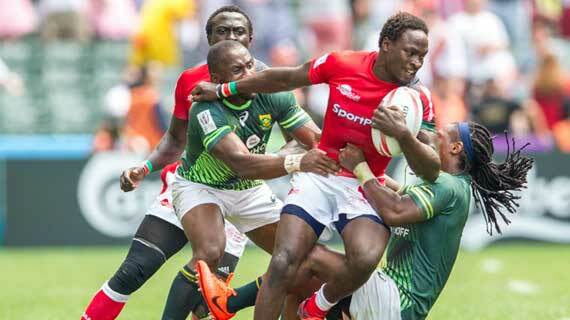 Kenya 7s have been pooled alongside Australia, Spain and Canada in a relatively easy pool B. A determined Kenya 7s fell at the last hurdle to finish second in the last HSBC World Rugby Sevens leg at Vancouver’s BC Place Stadium after losing to Fiji 31-12 in the final. This was the first time Kenya had reached the Cup final since 2016. For their efforts, Coach Innocent Simiyu’s gallant boys picked 19 points from Canada to push their tally total to 64 and cement position 8 in the HSBC World Rugby Sevens rankings. On the way to the final Kenya beat Spain 43-0 in the Main Cup quarters, thus a rematch is expected when the two sides meet in Hong Kong. Shujaa have a busy schedule in April as they take part in Hong Kong Sevens from April 6-8 before shifting attention to the Commonwealth games from April 13-15. From there, they will to the Singapore Sevens from April 28-29. Coach Innocent Simiyu is however not worried about the busy month as he confirms the preparation have been on point and they should be able to hold. “We saw this coming at the beginning of the season and we have adequately prepared. We will also look at the team after Commonwealth and make decisions on whether we need to add in or change players for Singapore,” noted the Coach Simiyu. For the three tournaments, Simiyu has named a squad of 13 players with Impala’s Ian Minjire earning a debut while Augustine Lugonzo returns. Simiyu says this has been occasioned by their performance in last weekend’s Victoria Sevens. “Minjire’s inclusion is more of tactical. We believe in picking players when their tail is up and he has been training consistently. What sold us out his how he played in Victoria and based on our approach where we want to be better in kick off, He brings in that advantage,” the tactician said. Shujaa will face Canada in the 2018 Commonwealth Games Rugby Seven games alongside New Zealand and Zambia in Pool C.
Oscar Ouma (Captain), Nelson Oyoo (Nakuru), Samuel Oliech, Ian Minjire (Impala Saracens), Andrew Amonde, Arthur Owira (KCB), Willy Ambaka, Eden Agero (Kenya Harlequins), Daniel Sikuta (Kabras Sugar), Collins Injera, Billy Odhiambo (Mwamba), Augustine Lugonzo, Jeff Oluoch (Homeboyz).